The Microbus is rolling again. That's right, Volkswagen has decided to build a new version of its iconic Microbus, this time in an all-electric version with a 270-mile range, according to company chief, Herbert Diess. The German company has frequently rolled out concept models for a modern take on the classic vehicle, but on Tuesday the UK publication quoted Deiss saying, "we will also have the Microbus that we showed, which we have recently decided we will build." The Microbus became a symbol of the 1960s era youth culture as cheap, reliable transportation, and nostalgia kept the model, in one form or another, popular for decades. Diess told the UK's Auto Express, "Emotional cars are very important for the brand. We are selling loads of Beetles still, particularly in US markets." 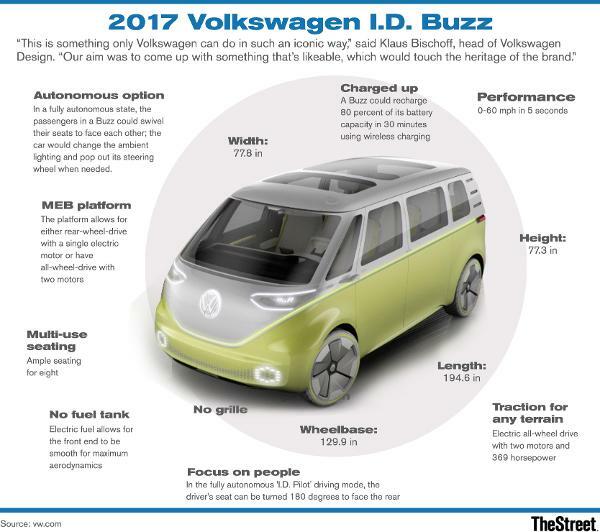 Volkswagen previewed the bus, known as the I.D. BUZZ, at the Detroit Auto Show this year.